If you like Orange Peel Quilts, it’s not difficult, to make your own templet and get started. This is indeed a marvelous way to use up some small scraps of your favorite fabrics. Use the instructions below to create the templet. This can easily be done by using a 3 1/2″ square piece of paper or interfacing fold once on each diagonal. Make marks as shown, then draw an arc between the dots. Use this templet as the finished size. 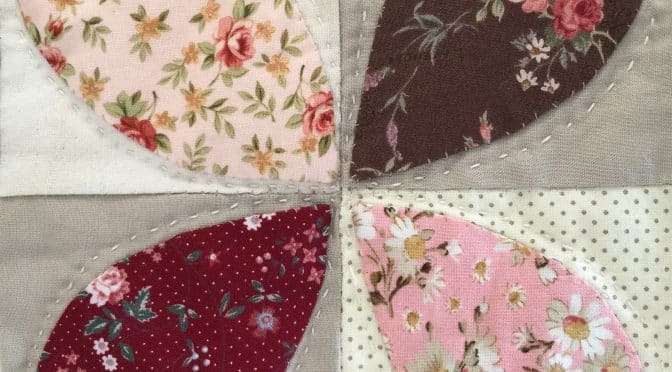 Therefore add a quarter-inch seam allowance for needle turn appliqué. I used a piece of iron on interfacing, the same size as the templet on the wrong side of the fabric, to stabilize the peel shape. If you prefer to machine appliqué, then this will be the finished size. For each block, one light background piece 4″ x 4″. 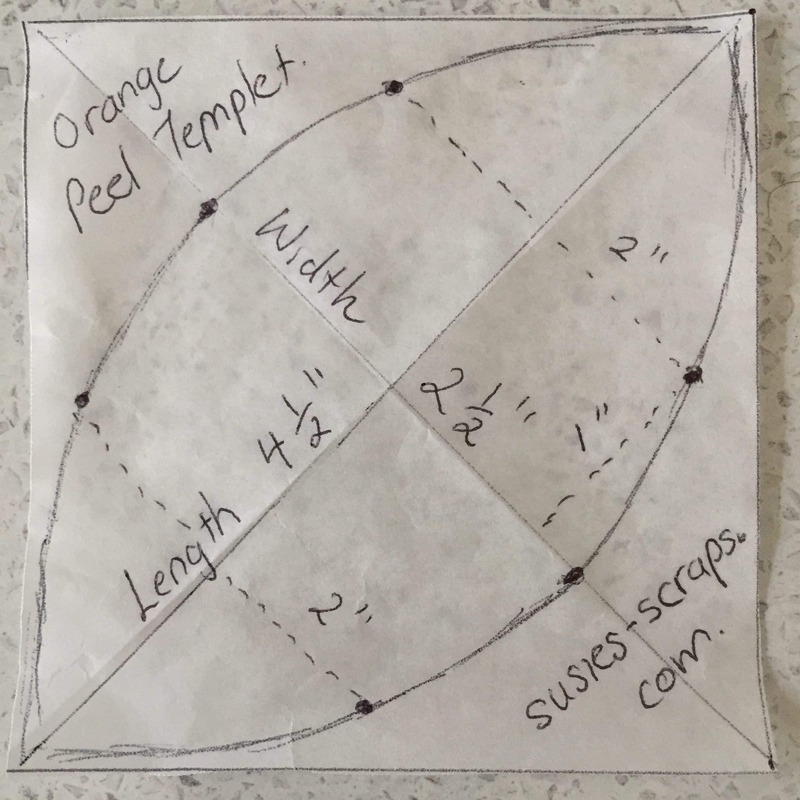 One medium or dark fabric 4″ x 4″ for the Orange Peel. 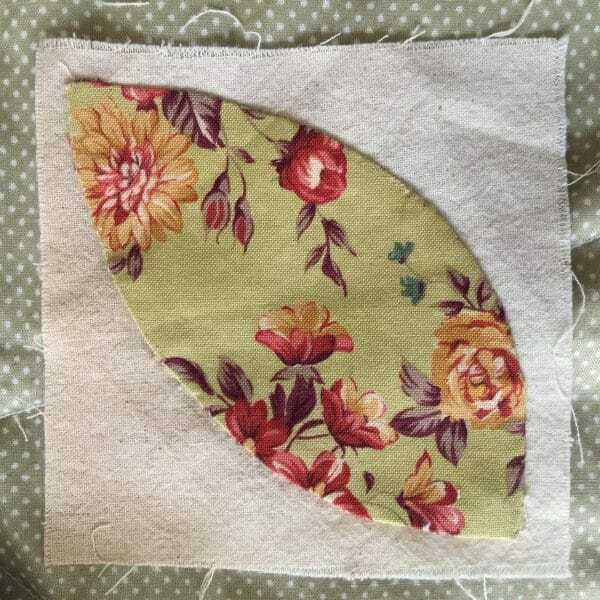 Lay the templet onto the darker fabric on the diagonal, cut out adding 1/4″ seam allowance, for needle turn appliqué. Cut out one interfacing same size as the templet. Iron the interfacing to the wrong side of the Peel shape centering it. Lay the piece diagonally onto the background. Pin in place. Choose a fine needle a neutral or matching thread. Starting at the centre of one side use the needle to ease the seam allowance under and up to the edge of the interfacing. Use a blind stitch/ slip stitch to sew the Peel onto the background fabric. Continue all the way around until back to the starting point. It may take a little practice to get used to easing in the points. Make 4 to make the finished block. 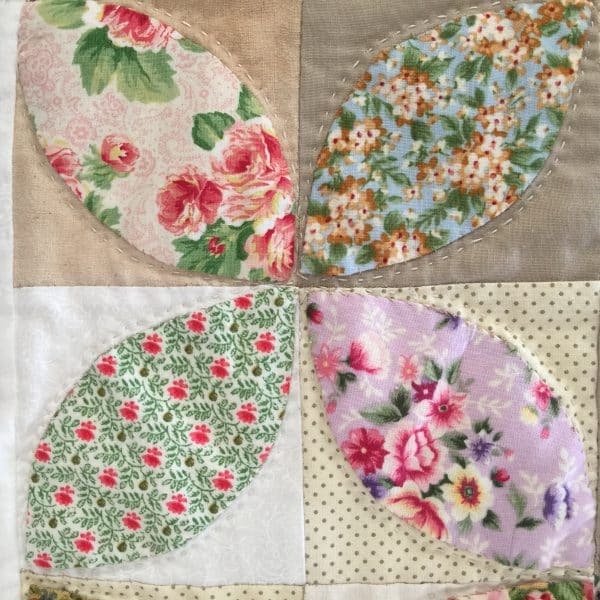 Sew together like a four patch orienting the blocks as shown. This block of four orange peels measures 7 1/2″. It will finish at 7″. Here is a link to the finished quilt.